The FDM4 General Ledger Module is fully integrated to the other ERP Modules to allow for automatic generation of General Ledger postings from the various sub-ledgers to increase efficiency and reduce posting errors by eliminating the need for manual entry. Through the use of user-defined Financial Accounting Periods and an unlimited number of General Ledger Accounts the system allows for the flexibility to accommodate the required financial structure for financial reporting and analysis. 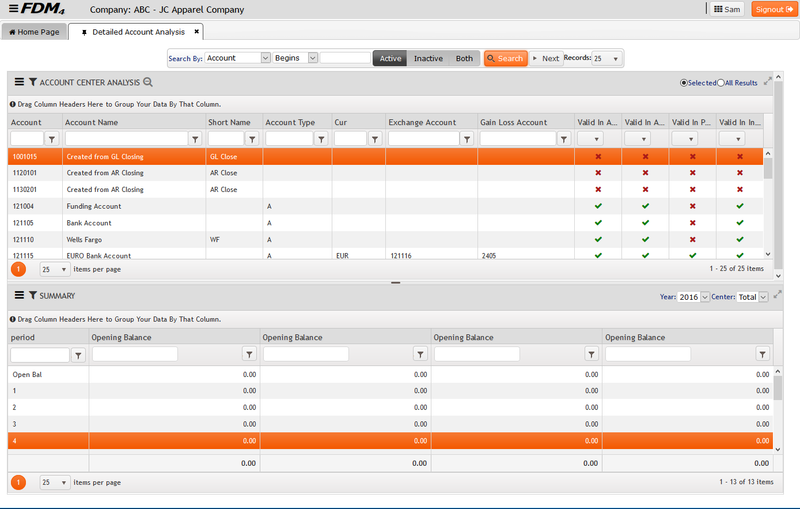 Automated generation of general ledger postings from sub-ledger transactions with no additional entry required. User-defined accounting period structure provides you with the ability to control posting by accounting period and transaction date. Single-entry and recurring journal entries available which both allow unlimited comments and attachments to be saved – including the ability to scan in paper-based documents. PayPal credit card settlement procedure to record settlement records from PayPal and comprehensive bank reconciliation procedures eliminate the need to manually reconcile. Enter and maintain an unlimited number of budgets and define standard distribution methods for your budgets. Multi-currency capabilities ensure your month-end posting procedures revalue balances using the most recent exchange rate. An unlimited number of cost centers can be defined and used in general ledger postings. Drill down capabilities from the general ledger posting and financial reports to the detailed original transaction. A custom financial report builder is available allowing for the generation of an unlimited number of financial reports as required. Includes month and year-end closing procedures and the ability to run an unlimited number of preliminary month and year-end closes. Daily deposit generation procedure available. A fully integrated Accounts Payable Module means that transactions can be generated quickly and easily with access to pertinent Vendor information and data from the Purchasing and Receiving processes. Payments can be processed for Vendors using the sophisticated Produce Checks option allowing checks to be printed directly from the system, and the availability of a Manual Payment process gives the flexibility to easily record payments that have been made through other means. Record liabilities incurred, scan and store original paper vendor invoice within the voucher, and generate multiple vouchers for goods received from a single PO all within one powerful voucher creation procedure. Customer refund checks will automatically close the credit off in the customer’s accounts receivable with no additional transactions required and you gain the ability to issue customer refund checks for outstanding credits on the customer account using the miscellaneous vendor. Ability to match in voucher entry to a single or multiple purchase orders, advanced shipment notices, or purchase receipts to generate liabilities for goods purchased. Automatic generation of vendor debit memo for vendor return shipments completed, including the ability to generate vendor debit memo transactions for non-product related debit memos. Miscellaneous vendor functionality to complete a one-time payment by generating the voucher and completing the check printing in a single transaction. Comprehensive check generation procedure that allows the user to select liabilities for payment using a number of different criteria. Ability to flag a voucher as being held for review or mark it as requiring a separate check. Ability to store an unlimited number of remit addresses by vendor for selection during voucher entry. 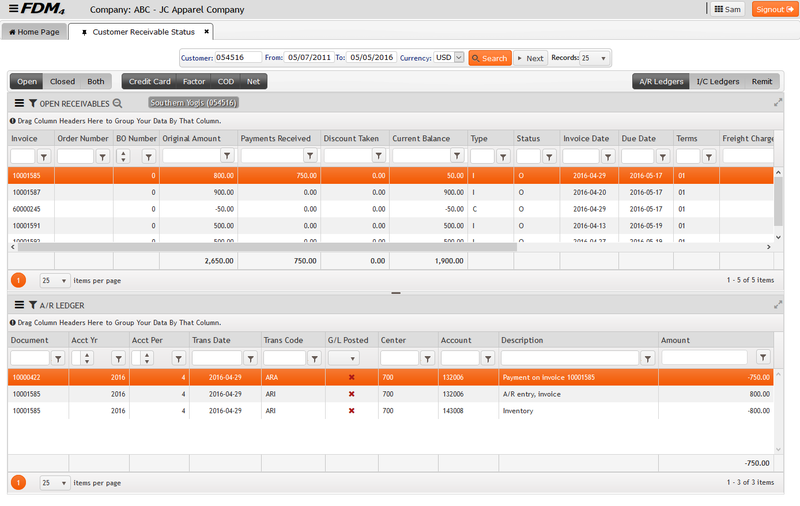 Ability to setup recurring payables to save time in generating duplicate monthly liabilities automatically. EDI and EASI standard 810 invoice processing capabilities. The produce checks procedures is designed to allow you to take advantage of early payment discounts allowing vouchers to be selected in a timely manner. Full 1099 functionality available in the system for setting up, reviewing and reporting on 1099 information, and generating the necessary 1099 forms. Automatic generation of general ledger postings for all transactions generated from the accounts payable module eliminating the need to rekey accounting data. Ability to reconcile checks using the check reconciliation procedure in accounts payable or the bank reconciliation procedure in the general ledger module. Aged payables and cash forecasting functionality available. Extensive landed cost and harmonization calculation and posting by vendor and product. 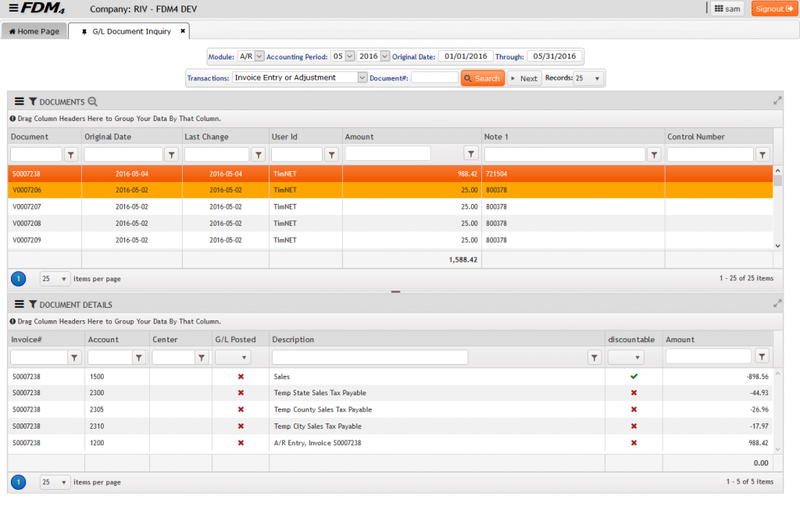 The FDM4 Accounts Receivable module will make Credit and Cash Collection functions more streamlined and easier to manage with quick access to the necessary information to make decisions regarding a Customer’s Account. Fully integrated to the Order Entry process Invoicing is completed automatically upon shipment of a Customer’s Order and thereby reducing the amount of time spent generating invoices, allowing focus to be spent on improving cash flow and maintaining Customer satisfaction. Automatic generation of invoices from the order shipping procedure, and credit memos from customer returns eliminates the need to manually generate notices for goods purchased/ returned. The ability to setup recurring receivables reduces the amount of time spent on generating duplicate monthly invoicing to customers for invoices not related to product purchase. Availability of a cash receipts by credit card process that will allow the user to pay off on account balances using a credit card processed in real time. With the integrated e-commerce application the customer can manage their own statement balance by viewing and printing statements online as well as paying off outstanding balances using a credit card. 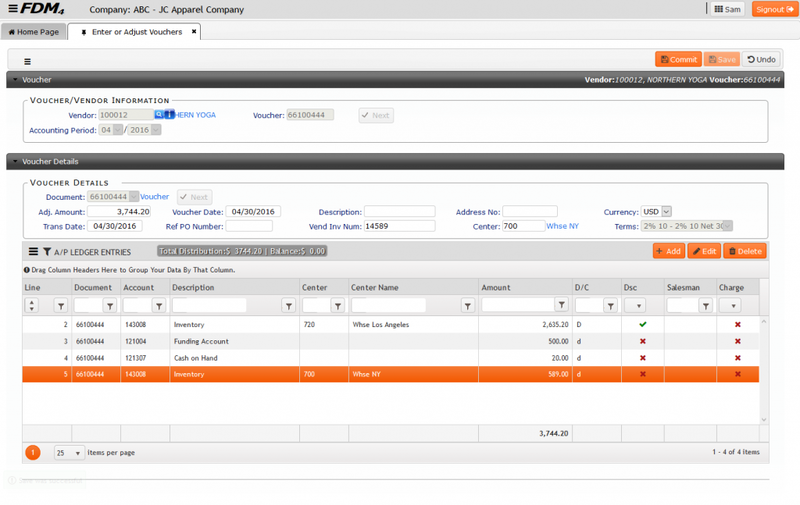 Ability to generate non-product related invoices and credit memos for customers. Multiple terms types available including: cash/cod, net, credit card, and factor terms. Automatic generation of general ledger accounting entries for accounts receivable transactions prevents the accounting data from being manually generated. Ability to define an unlimited number of aging methods that can be used when evaluating aged receivables. A comprehensive finance charge calculation procedure and the automatic generation of interest charge invoices on the customer’s account from the finance charge calculation procedure manages interest to be charged for outstanding balances. Default information is setup on the customer’s account that is automatically transferred to accounts receivable processes for efficient transaction processing including multiple ship-to addresses which can be defined for each customer and stored on file. Ability to back-date and produce single or batch statements and aging reports which accurately reflect the balance at a previous point of time. Entry and maintenance of an unlimited number of contacts per customer. Ability to write-off and discount receivables within the cash receipts application. Ability to generate “non-a/r” cash receipts using posting direct to a general ledger account that does not relate to an existing receivable, but affects the bank account. Drill-down capabilities are available in the accounts receivable review process from the invoice and credit memo to the related order or customer return transaction. Batch-style cash receipts processing capabilities with control total functionality Availability of multiple methods of applying cash to a customer’s account using the cash receipt application. Ability to generate receivables and other transactions in multiple currencies. Ability to process NSF checks including re-opening the original receivable and charging the NSF charge as required. FDM4 is a multi-company system that allows Financial Reports to be generated for the Parent Company in a summarized format across all individual operating companies using the Consolidations Module all without the need to export data to a third party application which increases efficiency and accuracy of data. Separate General Ledger Chart of Accounts can be maintained at the individual company level and a cross reference is generated to the Consolidated Chart of Accounts allowing for maximum flexibility for each Company. Intercompany transactions can be identified and eliminated where required during the Consolidations process when generating the parent Financial Statements. Define multiple hierarchies with unlimited levels of subsidiaries. Ability to setup hierarchies independently of chart of accounts. Ability to specify which companies are to be included in the consolidation process. 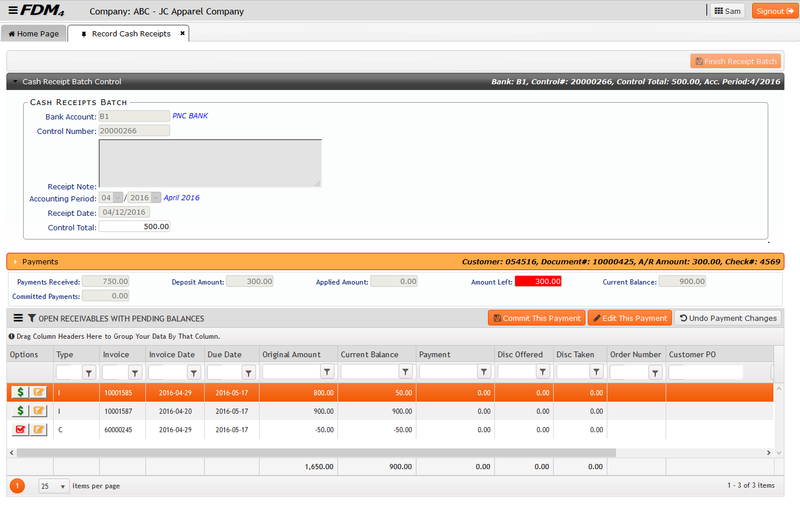 General Ledger accounts can be cross referenced directly to a consolidation account or split up down to the center level. Ability to define inter-company transactions that need to be eliminated during the consolidation process. Ability to enter notes to explain elimination entries. 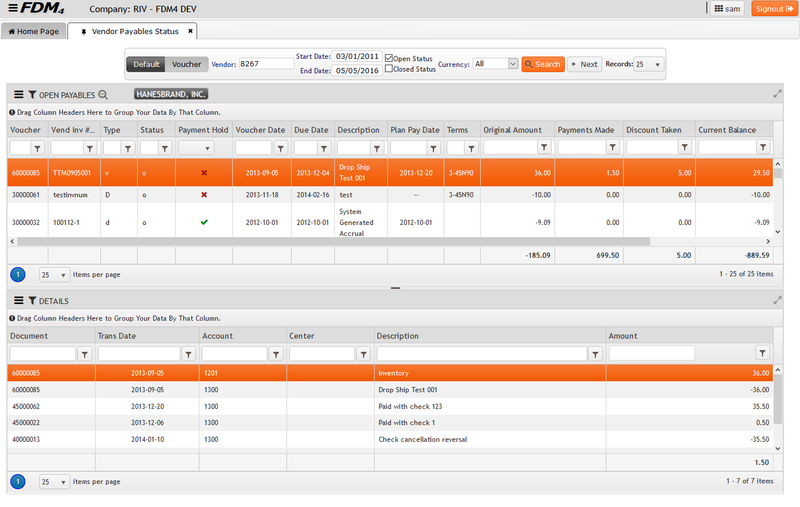 Ability to report on any Period, Quarter, or YTD, and to define an unlimited number of consolidated financial reports. Consolidated trial balance report is available for review prior to generating consolidated financial statements. Ability to generate the structure and content of the consolidated financial statements using the built-in financial report writer. The powerful and robust Accounting system that comes standard with the FDM4 ERP application allows for quick and easy access to mission-critical financial data that will allow you to make timely and informed business decisions. The Voucher Entry process allows for easy generation by allowing matching to Purchase Orders or Advanced Shipment Notices for goods that have been received or the use of Standard Documents for those that are not related to product receipts. Automatic calculation of Vendor Discounts based on the Vendor’s Terms Code, Due Dates for payments, 1099 information, and any required Landed Cost and Harmonization accruals will simplify the process while still maintaining accuracy and data integrity. With easy access to a wealth of Customer information the Accounts Receivable and Credit departments can take the information provided and make timely and informed Credit decisions with relation to the status of a Customer’s account when required. Comprehensive Cash Application processes will reduce the amount of time spent generating Customer payments. Automated month end processes makes period end processing a breeze.